While we allow customers to upload their own website files, we also offer useful tools if you have not yet created your website. All x10Hosting accounts have access to an online site builder, which allows you to easily create and publish your own website. Firstly, please click the green "Add Website" button on the cPanel home screen. Ensure that "Use Site Builder" is selected, and give your new website a name. Then, click "Add Website with SiteBuilder". When prompted, choose "Continue to My Websites". 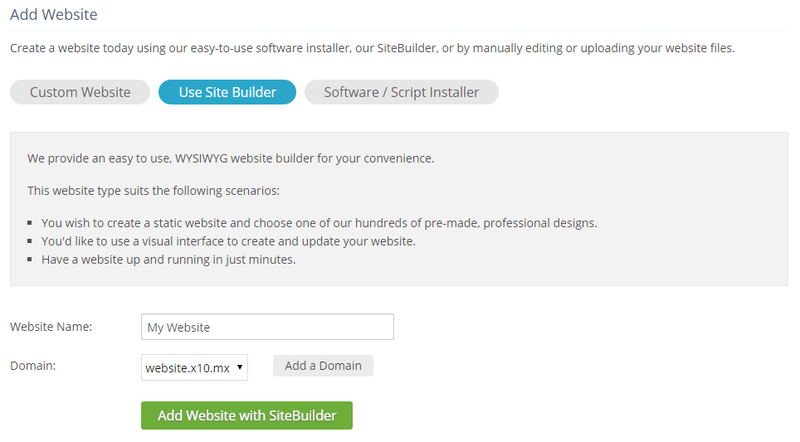 Under the website you have created, you will have the option to "Edit with SiteBuilder". After selecting a template, you will be able to create your new website. You can use the "Publish" button at the top to save your changes. On your cPanel home page, select "SiteBuilder" under "Software and Services". You will then be asked to select the domain that you would like the new website to be available at. After selecting a template, you will be able to create your new website. You can use the "Publish" button at the top to save your changes. My website is showing a blank page.